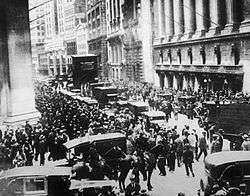 The stock market crash of 1929 marked the start of the Great Depression, the most widespread in modern history, with effects felt until the start of World War II. In economics, a depression is a sustained, long-term downturn in economic activity in one or more economies. It is a more severe downturn than an economic recession, which is a slowdown in economic activity over the course of a normal business cycle. The best-known depression was the Great Depression, which affected most national economies in the world throughout the 1930s. This depression is generally considered to have begun with the Wall Street Crash of 1929, and the crisis quickly spread to other national economies. Between 1929 and 1933, the gross national product of the United States decreased by 33% while the rate of unemployment increased to 25% (with industrial unemployment alone rising to approximately 35% – U.S. employment was still over 25% agricultural). Several Latin American countries had severe downturns in the 1980s: by the Kehoe and Prescott definition of a great depression as at least one year with output 20% below trend, Argentina, Brazil, Chile, and Mexico experienced great depressions in the 1980s, and Argentina experienced another in 1998–2002. South American countries fell once again into this in the early-to-mid 2010s, with the economies of Argentina, Venezuela and Brazil slipping into recession lasting more than 2 years as a result of falling prices on commodities such as in the 1980s. The economic crisis in the 1990s that struck former members of the Soviet Union was almost twice as intense as the Great Depression in the countries of Western Europe and the United States in the 1930s. Average standards of living registered a catastrophic fall in the early 1990s in many parts of the former Eastern Bloc - most notably, in post-Soviet states. Even before Russia's financial crisis of 1998, Russia's GDP was half of what it had been in the early 1990s. Some populations are still poorer today than they were in 1989 (e.g. Ukraine, Moldova, Serbia, Central Asia, Caucasus). The collapse of the Soviet planned economy and the transition to market economy resulted in catastrophic declines in GDP of about 45% during the 1990–1996 period and poverty in the region had increased more than tenfold. Finnish economists refer to the Finnish economic decline around the breakup of the Soviet Union (1989–1994) as a great depression; this is partly attributed to the breakup of the Soviet Union, and partly to the Scandinavian banking crisis, which was also suffered, to a lesser degree, by Sweden and Norway. 1 2 "The NBER's Business Cycle Dating Procedure: Frequently Asked Questions". Nber.org. Retrieved 2012-09-07. ↑ "Private Tutor". Infoplease.com. Retrieved 2012-09-07. ↑ "Diagnosing depression". The Economist. December 30, 2008. ↑ "About the Great Depression". English.uiuc.edu. Retrieved 2012-09-07. 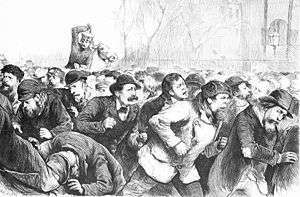 1 2 "Panic of 1837 (1837 - 1842) — History of Economic Recessions". Politonomist.com. 2009-01-02. Retrieved 2012-09-07. ↑ "Greece sinks deeper into depression in third quarter". Reuters. Retrieved 2012-11-14. ↑ Abrahamsen Y, R.; Aeppli, E.; Atukeren, M.; Graff, C.; Müller; Schips, B. (2005). "The Swiss disease: Facts and artifacts. A reply to Kehoe and Prescott". Review of Economic Dynamics. 8 (3): 749–758. doi:10.1016/j.red.2004.06.003. ↑ Kehoe, T. J.; Ruhl, K. J. (2005). "Is Switzerland in a Great Depression?". 8. Review of Economic Dynamics: 759–775. ↑ Chang, Ha-Joon. "Kicking Away the Ladder: How the Economic and Intellectual Histories of Capitalism Have Been Re-Written to Justify Neo-Liberal Capitalism". Post-Autistic Economics Review. 4 September 2002: Issue 15, Article 3. Retrieved on 8 October 2008. ↑ "What Can Transition Economies Learn from the First Ten Years? A New World Bank Report in Transition Newsletter". Worldbank.org. ↑ "Kalikova & Associates - Law Firm" (in Russian). K-a.kg. Retrieved 2012-09-07.